1.1. The terms and conditions set out in this Annex relate to our ADSL and Fibre Broadband services providing connectivity to the Internet (collectively “Broadband Services”) and are in addition to our standard terms. “Warranty Period” has the meaning given to it in paragraph 6.4. 1.5. We may from time to time amend the Terms, Charges or Services in accordance with clause 14. 1.6. Our Broadband Services are categorised as follows: a) ADSL broadband delivered over a conventional copper telephone line (“ADSL Broadband Services”); and b) Fibre broadband which uses a fibre optic cable to provide the connection from the telephone exchange to your nearest Openreach street cabinet and a conventional copper telephone line between the cabinet and your premises (“Fibre Broadband Services”). 1.7. To receive a Broadband Service from us you must do one of the following: a) install a new line with us and pay us for the line rental; or b) transfer your existing line from your current provider to us and pay us for the line rental; or c) keep your existing telephone line with your current provider and continue paying them line rental in connection with the line. 1.8. Further details concerning the use or transfer of an existing line, or the installation of a new one, are provided in paragraph 2. 2.2. If it appears we are able to provide you with the Service, you will be asked to submit an order. On receipt of this, we will carry out a number of checks in accordance with clause 4.3 to determine whether we can provide you with the Service at your premises. We will notify you of the outcome of these checks by either sending you an Order Confirmation, or by explaining that we are unable to provide the Service. 2.6. If the Existing Line can be used, we will arrange for Openreach to carry out the necessary work to configure and activate the Broadband Service. This is unlikely to require an engineer visit to your premises, but where such a visit becomes necessary, we will arrange one in accordance with paragraph 3. We will inform you by email once activation has taken place so that the Service is available for use by you and it has been assigned to your Bellcom Communications account. We will then, in accordance with clause 13.1, issue you with the invoices relating to the installation and for your first period of use of the Service. If you are a new customer, this period will be the first month in which you use the Service starting on the Activation Date. If you are an existing customer, your first invoice will cover the period from the Activation Date until the next monthly anniversary on which you became a Bellcom Communications customer and invoices will be issued on a monthly basis after that. 2.7. Where you require a new telephone line through which to receive a Broadband Service, we will arrange for Openreach to send an engineer to install one at your premises in accordance with paragraph 3. New installations for Broadband Services typically take around 5-10 Working Days after the Order Confirmation has been sent to you, but order times can vary. 2.8. Once Openreach informs us that the installation work has been successfully completed, we will arrange for your Broadband Service to be properly configured and activated. We will inform you by email once activation has taken place so that the Service is available for use by you and it has been assigned to your Bellcom Communications account. We will then, in accordance with clause 13.1, issue you with the invoices relating to the installation and for your first period of use of the Service. If you are a new customer, this period will be the first month in which you use the Service starting on the Activation Date. If you are an existing customer, your first invoice will cover the period from the Activation Date until the next monthly anniversary on which you became a Bellcom Communications customer and invoices will be issued on a monthly basis after that. 3.2. Where we inform you in advance that an engineer appointment will require Site access, if neither of the Site Contacts is present to give the Openreach engineer that access, and you have not cancelled the appointment by email at least 48 hours in advance, we will pass on to you at cost, the Openreach missed appointment charge (currently £125.00 plus VAT) or another figure that we notify you of in advance. 4.2. If your Broadband Service is interrupted by a Phone Line Change, and you would like us to reconnect you (and we are able to do this), we will charge you a reconnection charge of £75.00 on top of all other Charges payable under the Terms. 5.1.1. that you are transferring the relevant communications service to us; 5.1.2. a reasonable estimate of when the transfer will occur; 5.1.3. your right to terminate the Contract in respect of the service being transferred; and 5.1.4. our relevant contact details that you may need in connection with the transferred service. 5.3. You may, without penalty, cancel the Contract in respect of the service being transferred by notifying us by telephone, email or post by 9am GMT/BST on the last Working Day before the Activation Date. To be effective, a transfer cancellation notification given by post or email must be deemed received in accordance with clause 18.2 before 9am GMT/BST on the last Working Day before the Activation Date. This right to cancel takes precedence over any conflicting provision in the Main Body Terms. 5.5. To transfer your Broadband Service away from Bellcom Communications, you should contact your new/prospective provider. Depending on the circumstances, it may not be possible to transfer away some installations of Broadband Services (in which case you will need to request a new service installation from your new/prospective service provider). Please note that for all transfers away from Bellcom Communications, (or other Broadband Service cessations), you will be required to pay all Charges associated with your Broadband Service for the Minimum Contract Period as well as during the relevant period of notice required under the Terms. 6.1. Some of our ADSL Broadband Services come supplied with a wireless router, associated cables and microfilters (“ADSL Hardware”) while others are supplied on a ‘wires only’ basis meaning you must purchase ADSL Hardware separately from us or equivalent hardware from a third party supplier. 6.2. Some of our Fibre Broadband Services come supplied with a VDSL router, associated cables and microfilters (“Fibre Broadband Hardware”), while others are supplied on a ‘wires only’ basis meaning you must purchase Fibre Broadband Hardware separately from us or equivalent hardware from a third party supplier. 6.4. The Broadband Hardware comes with a warranty lasting 12 months (“Warranty Period”). If the Broadband Hardware becomes faulty during Warranty Period, we will repair or replace it providing the fault has not (in our reasonable opinion) been caused as a result of any of the circumstances set out under clauses 5.11.2 to 5.11.4. Where we reasonably believe the Broadband Hardware has been used in contravention of clauses 5.11.2 to 5.11.4 and you wish to receive replacement Broadband Hardware under the warranty, we reserve the right to charge you the price associated with the relevant piece of Broadband Hardware (or the nearest equivalent) on the date on which you make a claim under the warranty. 8.1. Our Broadband Services come with download allowances for each monthly billing period starting on the Connection Date. 8.2. You will be charged £1.00 per gigabyte where you go over the relevant download allowance figure set out under the Order or Agreement. 9.1. You will receive a number of static IP addresses to use in conjunction with your Broadband Service (the number you are eligible to receive depends on the Service package you select). Subject to their availability, you may choose your desired IP addresses when you place your order for your Broadband Service. 9.4. You can purchase more static IP addresses from us. 11.1. If your Broadband Service is suspended for failure to pay the Charges under clause 15.4 and you subsequently pay those Charges and ask us to reconnect you, we will charge you a reactivation charge of £45.00. 11.2. If during the Minimum Contract Period you terminate the Contract for your Broadband Service, our wholesale supplier will charge us £45.00 which we will pass on to you at cost and you are required to pay this in addition to any other charge required under the Terms. 12.1. 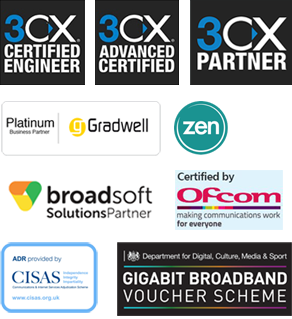 You can purchase as an ‘add-on’ an enhanced care commitment for some of our Broadband Service packages. 12.2. Where this add-on is purchased and your Broadband Service suffers a technical problem which is directly attributable to a fault within the Openreach network (determined at Openreach’s sole discretion), Openreach aim to resolve such faults within 24 hours of being reported by us. Where you report qualifying problems to us in accordance with this Annex, we will use our reasonable endeavours to cooperate with Openreach so that they can adhere to this 24 hour fix target. However, if Openreach fail to meet the 20 hour fix target, it will not constitute a breach of the Contract and no remedy will be available to you in connection with the missed target. 12.3.1. By emailing our advertised support email address (which can be done 24 hours a day, 7 days a week); or 12.3.2. by phoning us on our advertised support numbers during the hours of 09.00 to 17.00 on Working Days. 12.5.1. Promptly send to you a support ticket featuring a unique ticket number; and 12.5.2. Initiate an investigation in conjunction with our relevant wholesale supplier during our normal office hours specified in paragraph 12.3.2. 13.1. Details of all prices in this Annex, Order, Agreement or Proposal / Quotation are exclusive of VAT. 13.2. The prices for our Goods and Services will be those which are set out on the Order at the date on which the Contract is formed (as described in clause 4.3), and will be confirmed on the Order Confirmation.